What is a concertina book? It is another name for a folded structure that resembles an accordion. 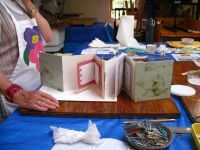 In this class you will learn how to expand the concertina book form both literally and figuratively when you use a simple pamphlet stitch to create multi-book forms which can also extend outward beyond the concertina book. 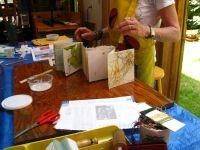 You will use beautiful handmade paper for the hard covers; collage and create interior books using handmade and assorted decorative paper; and add embellishments, images, and text to interior spaces. This book can be beautifully displayed to reveal both the front and back pages, or pages can be turned as in a closed book form. 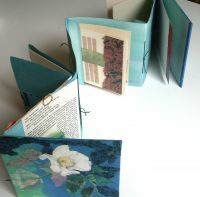 A very unique and cohesive book, this expanded concertina makes a wonderful travel journal or family memory book or special thematic artist book with your own personal vision.